We are so excited about our Thanksgiving project this year. Page, Molly and I decided to work on something together, quilting bee style, and what better occasion to do so than for Thanksgiving! It is such a pleasure to work side by side with friends or family to create something beautiful and timeless for such a special day. We got more quality time together than we’ve had in a long time and it left us wishing we could do all our projects like this. 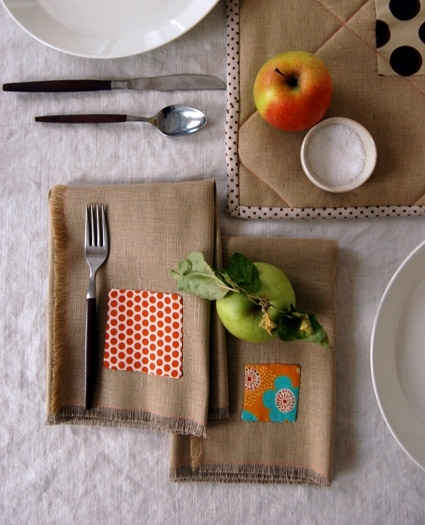 The table runner is extra thick so although it looks pretty its true function is as a hot pad that runs the length of your table. Now you can have a piping hot turkey and all of those yummy side dishes within arms reach of your guests without the worries of burn marks on your dining table. 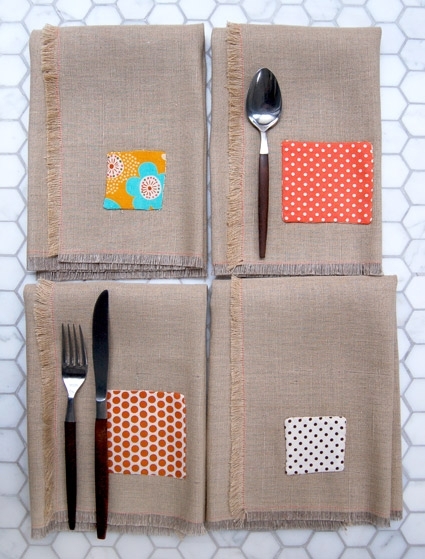 Add Molly’s beautiful oversized napkins to catch every drip and you’ll be able to relax during one of the more stressful meals of the year! 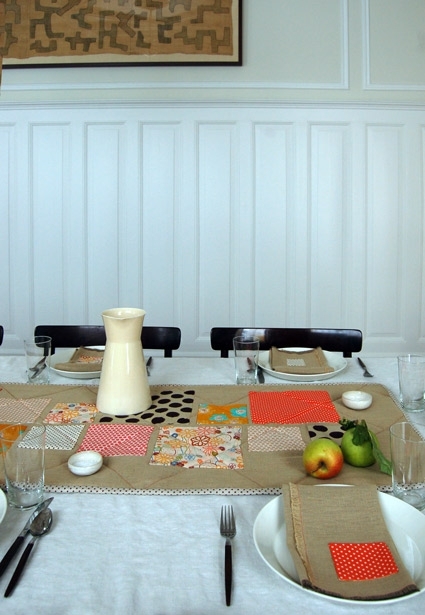 While Molly made beautiful oversized Fringed Thanksgiving Napkins, Page and I tackled the runner. As I was cutting, Page was sewing and Molly was fringing. 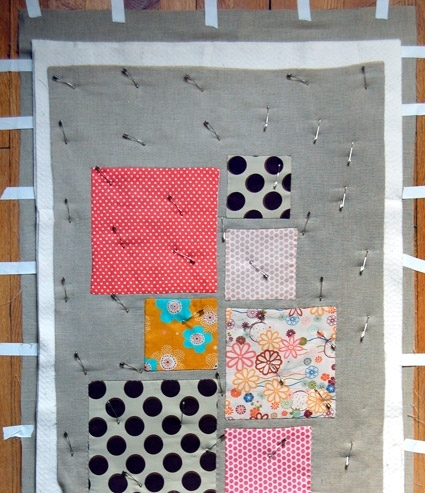 When it came time to hand applique the squares, we did so in tandem at opposites ends of the runner. We had a few tug-o wars, but we settled them in a mature fashion! We wanted the whole ensemble to be warm, cozy and natural while also feeling happy, colorful and contemporary. We used Globalweave’s Linen Blend for the background of the runner and the napkins. 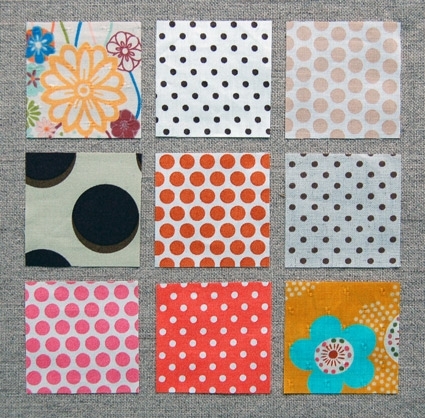 For the appliqued squares and binding, we used a cheerful array of polka dots accented with Japanese florals. 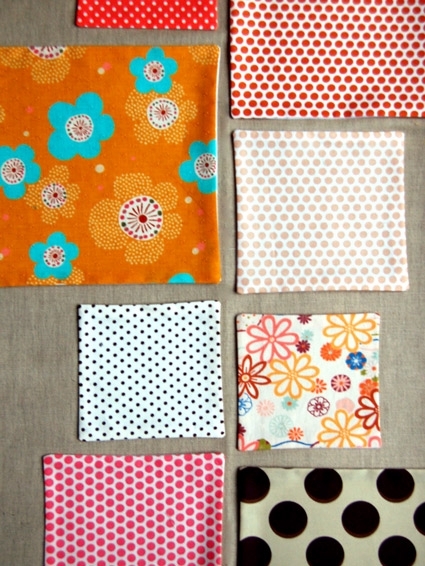 1/4 yard each print (this is enough to make applique patches for both the runner and the fringed napkins). The finished measurements for our runner are: 20-inches wide x 92-inches long. If you make your runner the same dimensions as ours, you will need 2 3/4 yards to make both the background on the front of the runner and to use on the back. If your runner will be significantly longer or shorter than ours you can figure out your yardage by adding at least 6-inches to the finished length of your runner then dividing it by 36 (the amount of inches in one yard). For instance, if you would like your finished runner to measure 60-inches, you would need to purchase 66-inches of fabric. 66 divided by 36 = 1.83 yards. 1.83 yards is a little more than 1 3/4 yards, so you would need to purchase 2 yards to have enough fabric to complete your project. The Globalweave Linen Cotton we used is 56-inches wide which gave us plenty of width for both the front and back of our runner. If you choose to use a different background fabric (such as any of the other fabrics we have recommended above which are 42-inches wide) you will want to keep your runner no more than 18-inches wide in order to have enough width from one piece of fabric for both the front and back. If the finished measurements of your runner will be wider than this you may want to substitute a different fabric for the back or you can purchase a double length of the background fabric. 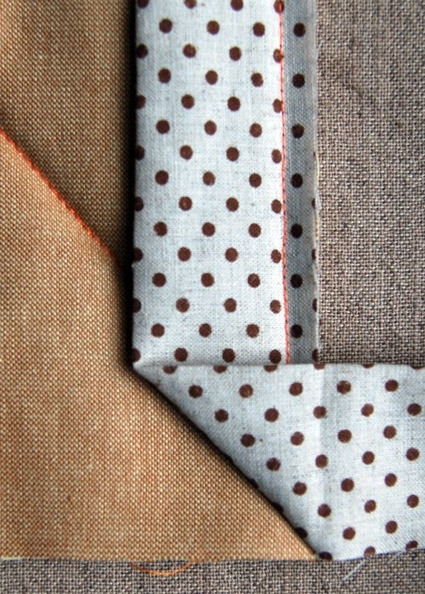 We used an additional 1/2 yard of Cosmo Fabrics – Natural Dots, Brown. If your runner is significantly different in size from ours, check below to determine how much yardage you will need. Believe it or not, the formula for figuring out the amount of yardage you will need for the binding on your project is quite simple. Keep this formula handy for future quilts too! Please note, because this project is extra thick we had to cut our binding strips 3-inches wide (a normal double-fold binding is cut 2 1/4-inches wide). Divide the perimeter (ours is 236-inches) by the width of your binding fabric (ours is 42-inches) and round up to the nearest whole number to determine the amount of strips you will need to cut. (In our case 236-inches divided by 42-inches = 5.619, rounded up is 6 strips). Multiply the amount of strips you will need (in our case 6) by the width in inches you will be cutting your strips (for this project 3-inches) to determine the amount of fabric (in inches) that you will need. (In our case 6 strips x 3-inches = 18-inches, or a half yard of fabric). The applique in this project is made using lightweight fusible interfacing. We used 2 yards to make the patches for the runner and had enough left over to make the appliques for 10 napkins too. You will need thread to match the background fabric for appliques and a contrasting thread for the machine quilting. Be sure to get batting that is at least 4 inches longer in at least one direction than the length of your finished runner. In our case we needed to get the Extra-Double Size. Considering that you will be using your runner for food it is highly likely that you will want to wash it once your Thanksgiving festivities have concluded! In order to wash without fear once your project is complete, it is recommended that you pre-wash, dry and press all fabrics before you begin cutting and sewing. If you choose to use the Globalweave Linen Blend that we used for our background fabric, we recommend pulling it out of the dryer while it is still a bit damp and pressing it with a hot iron (this will help prevent it from becoming too wrinkled in the dryer). Prewash and Dry all fabrics on a normal cycle. 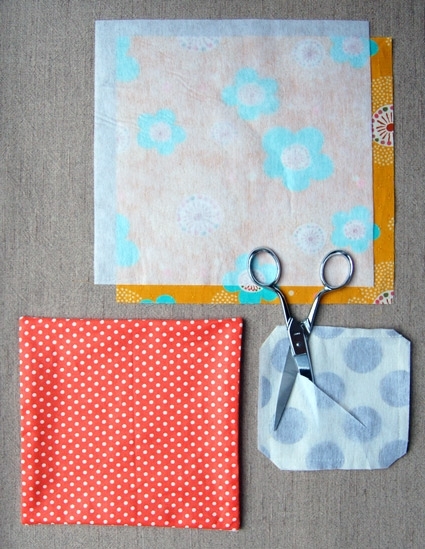 Cut background fabric to the finished size of your piece (in our case 20-inches by 92-inches). It can be a challenge to cut such a long piece perfectly straight but there is a way to do it if you have a lot of patience. 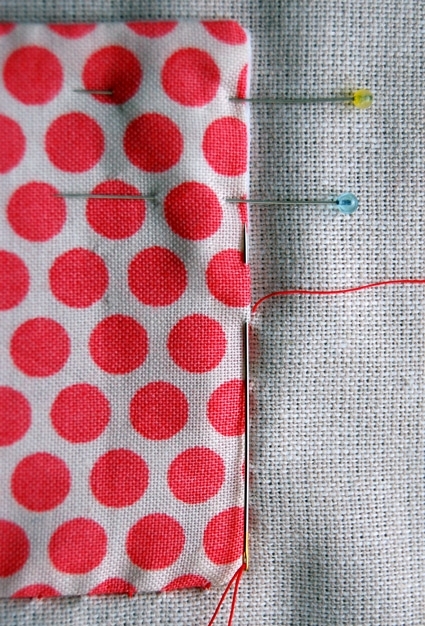 Follow the steps for pulling a thread as a cutting guide in Molly’s Lovely Lined Curtain Project Journal. Otherwise, you can very carefully fold your background fabric and cut it with your rotary cutter in one go, but be aware that if you do this your piece will not be perfectly straight (we admit that we cut ours this way). Once your fabric is cut, you’ll want to lay it out somewhere so that you can use it to determine the arrangement of your applique squares. Cut backing fabric 6-inches wider in both directions than your finished runner (in our case 26-inches by 98-inches) and set aside. Take the batting out of its packaging, open it up, and fold it in half lengthwise. Cut the doubled batting down to create two layers that are 4-inches wider in both directions than your finished runner (in our case 24-inches by 96-inches). The batting does not need to be cut perfectly square because you will trim it down after quilting your runner. Just cut it as straight as you can without worrying too much over it. Set aside. There are probably as many ways to do applique as there are people who do it, this is one way to do it using lightweight fusible interfacing. Heather Ross was kind enough to explain this technique to us. Use your rotary cutter, ruler and cutting mat to cut squares from each of your applique fabrics. Check out our Rotary Cutter Tutorial for help using a rotary cutter. We cut about 6 squares from each of our 9 prints ranging from about 3-inches square up to 8-inches square which was more than enough to complete our project. Before we made our applique squares into patches we determined how we wanted arrange them by laying them on our background fabric. We ended up arranging our squares in two lines 3/4-inches apart from the center, we used a total of 25 squares. We used our leftover squares to cut smaller squares for the appliques on the napkins. Pin layers together and sew all the way around the edge using 1/4-inch seam allowance to create your patch. Cut an opening in the interfacing large enough to turn the project right side out, trim corners of patch to within 1/8-inch of your corner seams. Turn patch right side out, use your knitting needle to gently poke out the corners. Using your hera marker, mark two straight lines down the center of your background fabric, 3/4-inch apart. Use the lines as a guide to place your patches. 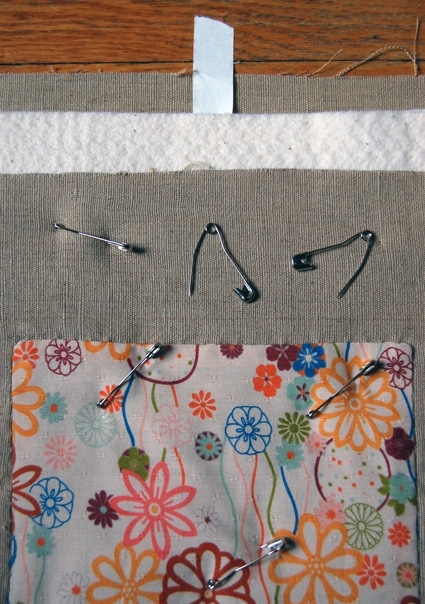 Once your patches are in place, press them with a hot iron to fuse the interfacing to the background fabric. The fusible interfacing will hold your patches in place until you’re ready to stitch them down. As you stitch your appliques the fabrics tend to shift around. To keep your patches from becoming crooked when you stitch them pin along the edge of each patch before you begin to sew. We found that it was best to sew all of the patches first along the center lines and then once that was done to finish each patch individually. Below are the complete steps for using a blind stitch to sew your applique to the background fabric. This stitch is very simple and almost completely invisible! 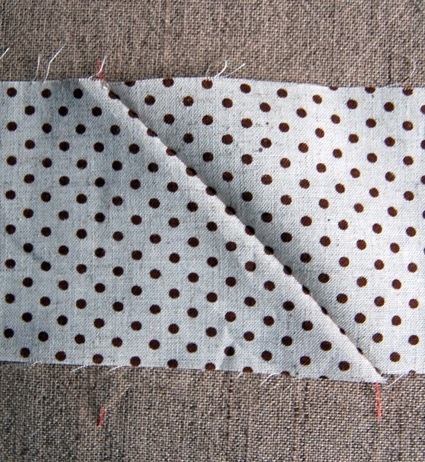 We recommend that you use this stitch to finish your double-fold binding as well. Thread your hand sewing needle with thread that matches your background fabric (for the purposes of this tutorial we’ve used contrasting thread so you can see it). Hold needle between the index finger and thumb of your dominant hand. With your other hand, pick up the opposite end of the thread. Point the needle and end of thread towards one another. 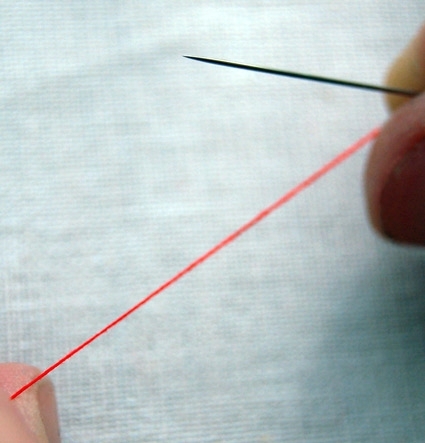 Grasp the end of the thread between the same thumb and finger holding the needle. 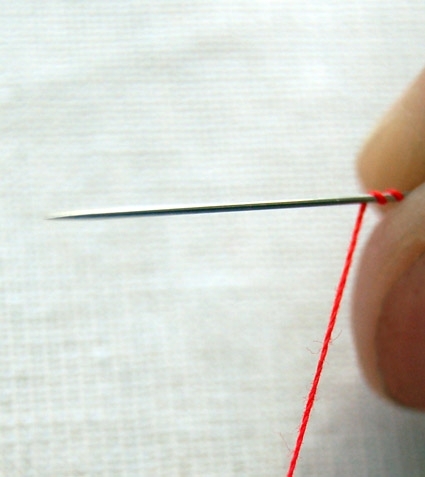 With your other hand, wrap the thread around the needle two times. Pinch the wrapped thread with the fingers holding the needle. 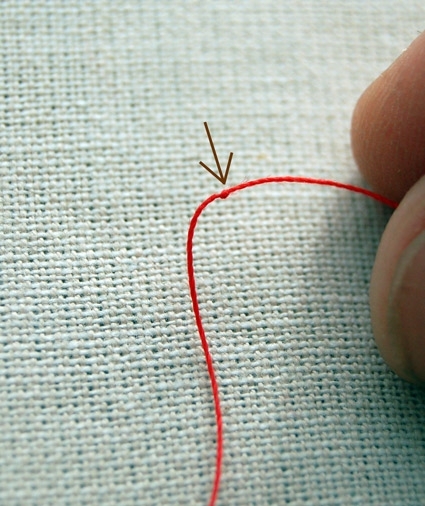 Pull the end of the needle with your other hand (while continuing to pinch the wrapped thread) until the entire length of thread has passed through your fingers. You should have a small knot near the end of the thread (if you don’t you probably weren’t holding the wraps securely, but try again, you can do it!). 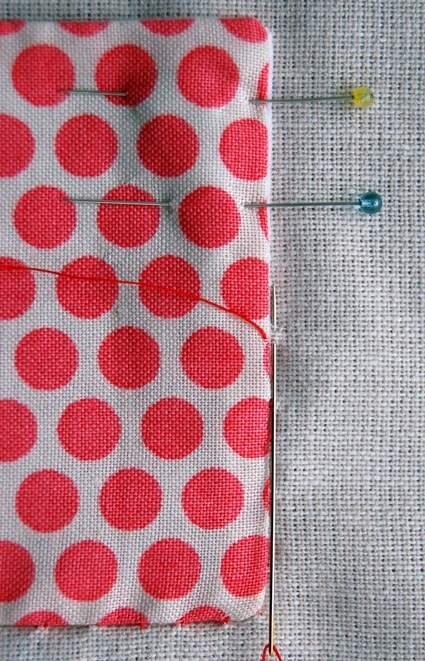 Insert needle into the front of your patch (but not through the interfacing or background fabric) about 1/2-inch from where you want to begin and pull the needle out at the very edge of your patch as shown above. The knot at the end of the thread is indicated with a blue arrow. 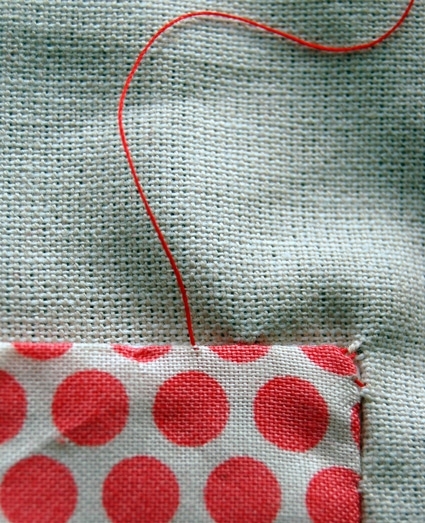 Pull the thread with a quick tug to “pop” the knot to the inside of the patch. Now you’re ready to stitch! *Take a tiny stitch (2 or 3 threads) in the background fabric as pictured above. Pull thread taut. Take a small stitch at the very edge of the applique, beginning just where the thread came out of the background fabric as pictured above. Pull thread taut. Repeat from *. As you become more familiar with this stitch you can move your needle in and out of the background fabric and applique fabric without pulling the thread taut in between. This will make your progress much quicker. Once you’ve got your appliques all stitched its time to prepare for quilting. You will need a clean large surface that will accommodate the entire backing fabric for your runner. (If you have wooden floors they’re perfect for this, just make sure they are free of dust before you start). After making sure that your surface is clean, lay your backing fabric out, right side down. Using masking tape, begin taping the center of each long side to the surface. Pull the fabric taut as you tape it to smooth it out, but don’t pull it so tight that you stretch it. Once you’ve taped each side’s center, start taping out towards the short ends, alternating sides as you work to keep the fabric completely smooth. When you are getting near the ends of your long length (about 12-inches or so away) tape the center of the short sides and then work each of the four sides toward the corners. When you are finished the fabric should be completely smooth and straight. Place your doubled layer of batting on your backing fabric so that you have 1-inch of the backing fabric showing all the way around the edge. Handle the batting with care to avoid stretching it out, gently smooth it out from the center. Lay your appliqued fabric on top of the batting right side up. Smooth it out gently onto to batting from the center. You should have 2-inches of batting showing all around the edge of the top fabric. 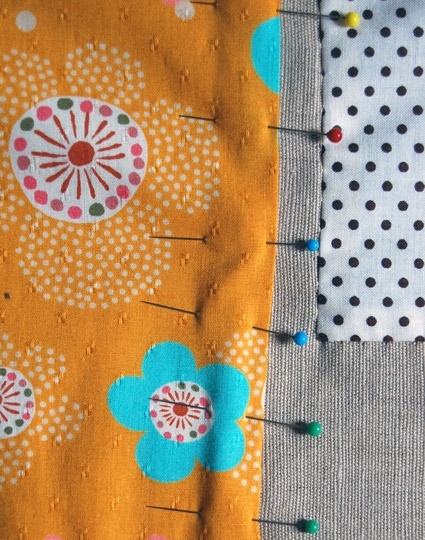 Before you start pin basting, it is helpful to open all of your pins (its even more helpful if when you remove them as you quilt you leave them open for your next project). 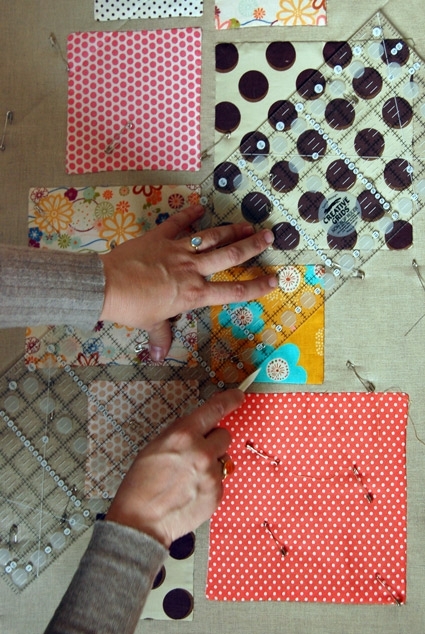 Place your first pin in the center of your project. Then pin outward in concentric circles about a fist’s distance apart or approximately 3-inches until you reach the sides. Continue to pin along the two lengths from the center out toward the edges until you reach the ends. 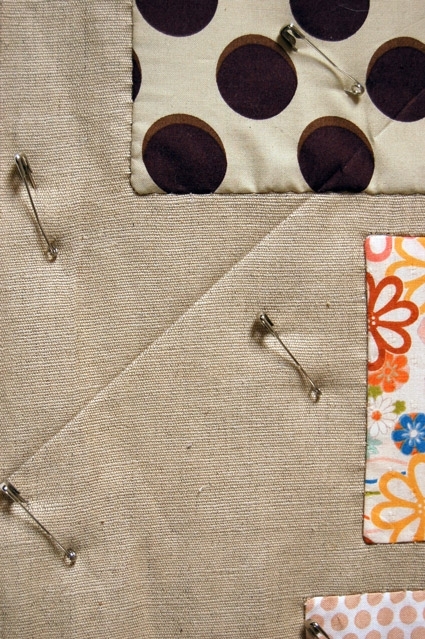 Pin all the way to the edges and corners of your quilt sandwich to ensure that your quilt doesn’t flip under on itself when you being quilting. 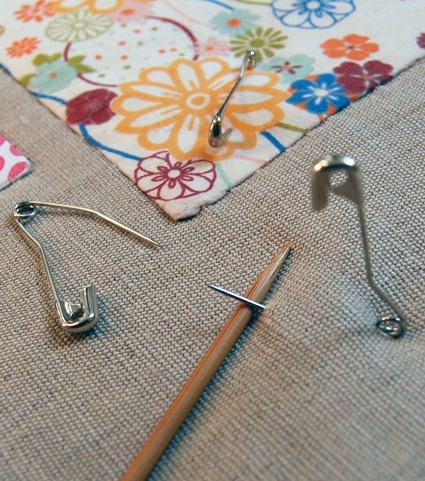 Use your knitting needle or similar tool to lift the pin’s arm into the catch. It is usually quicker to place as many pins as you can reach and then close them all at once rather than placing and closing one pin at a time. 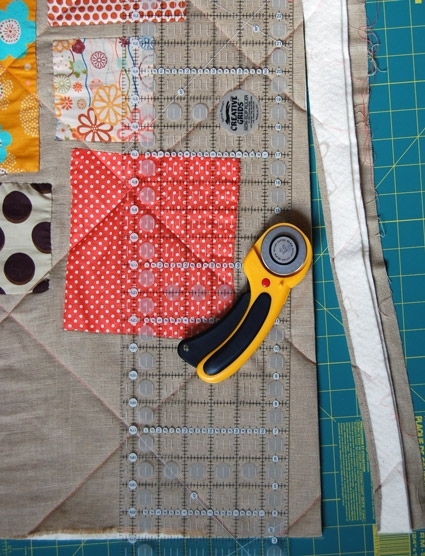 Use your Hera marker and your cutting ruller to mark your quilting lines. We chose to use a diagonal grid for our quilting pattern which is a great option when you are quilting on top of a pattern that may not be perfectly square. Our diagonal lines are 8-inches apart, the broadest distance between quilting lines recommended for this batting by the manufacturer. If you come to pins while marking your quilting lines, just skip over them. 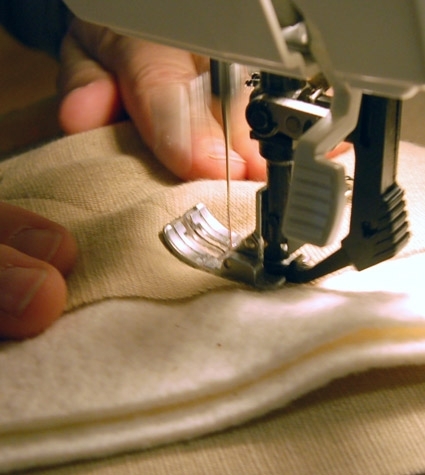 Before you begin quilting, prepare your sewing machine by putting on your walking-foot. Thread your machine and bobin with your quilting thread (we also recommend winding two bobbins for this project before you begin quilting). Quilt your project from the center out toward the ends. Roll your project up from both ends leaving just the area you want to quilt exposed in order to fit it through the arm of your machine on one side and to keep it from weighing the project down on the other side. Begin your quilitng in the center of one of the long sides, off of the edge of the top fabric directly on the batting (this way you won’t have to do any backstitching to secure the thread). 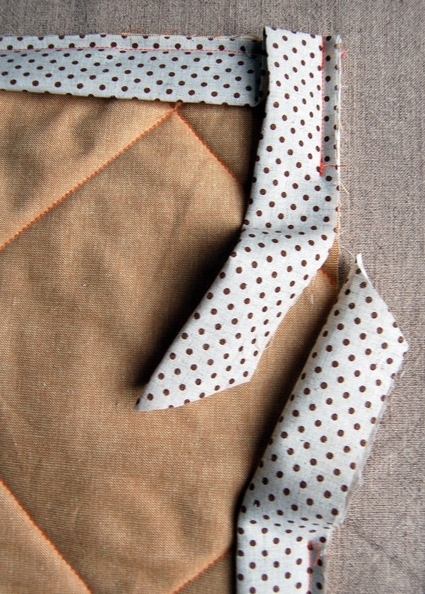 As you quilt gently push the fabric toward the walking foot so that it looks slightly buckled ahead of the foot. This allows the foot to take the fabric in evenly on both the top and bottom (this may seem strange, but we promise it will give you the best results!). Remove safety pins about an inch before you come to them. Quilt all the way to the opposite end, sewing off the edge of the top fabric and onto the batting. Repeat on all marked lines until the piece is complete quilted. 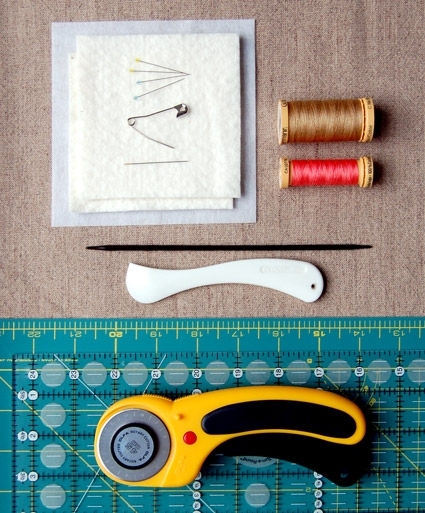 Use your rotary cutter, cutting mat and cutting ruler to trim the excess batting and backing fabric from your runner. Quilting your project will usually distort it to some degree, however, when you trim the excess batting and backing fabric you shouldn’t have to trim much, if any, of the top off. In our case we trimmed a bit here and there in order to remove fraying ends from the top and to create a very straight edge. Move your mat and ruler up along the sides as you trim. 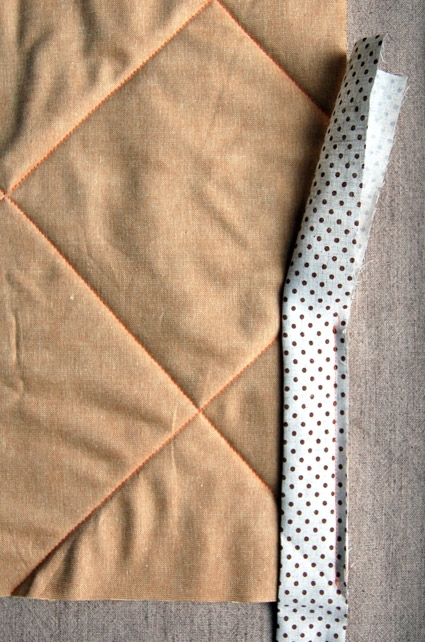 There are many ways to do a binding on a quilted project, and we tried two for this one. We recommend a double-fold binding for this project which is attached by machine one one side and finished by hand on the other rather than a completely machine attached binding because of the thickness of the batting (the completely machine attached binding looked very bulky and messy). Cut enough 3-inch wide strips to make the binding (use the formula above to figure out how many you need), in our case we needed 6 strips. To piece binding strips lay your first strip horizontally, right side up. Lay a second strip at a right angle to the first strip, right side down over the first strip’s corner as pictured above. Use your Hera marker to mark a diagonal line from the top left corner on the upper strip to the lower right corner of the bottom strip. Pin together. 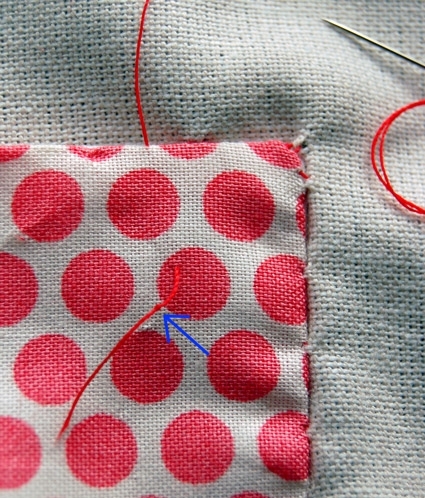 Sew a seam directly along this line. Trim the corner to the right of the seam, leaving a 1/4-inch seam allowance. Repeat this process to join all strips into one long continuous piece. Fold binding in half lengthwise, wrong sides together. Do not press fold. Beginning in the middle of of one long side of the FRONT of your runner, align and pin the binding’s raw edges to the raw edge of the runner. Leave about 5 inches unpinned at the beginning so that when you are though attaching the binding you can finish it nicely. Pin to within 1/4-inch of the corner. 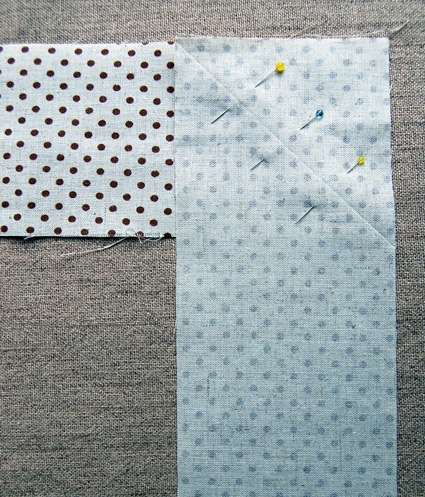 Use your walking foot to sew binding to runner, stopping 1/4-inch from the corner as pictured above). 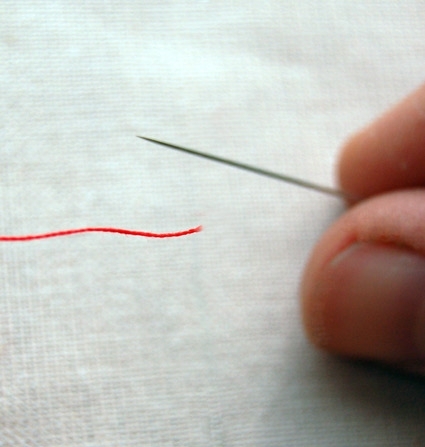 Backstitch at the beginning and ending of your seam. 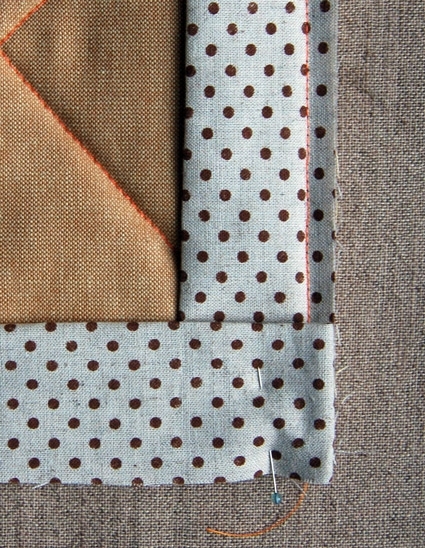 Fold binding strip away from the quilt, perpedicular to the seam you just sewed, as pictured above. Fold binding strip again this time towards the runner as pictured above. Be sure that the fold lines up evenly with the edge of the quilt. Pin the corner into place as pictured above. Continue pinning to within 1/4-inch of the next corner. 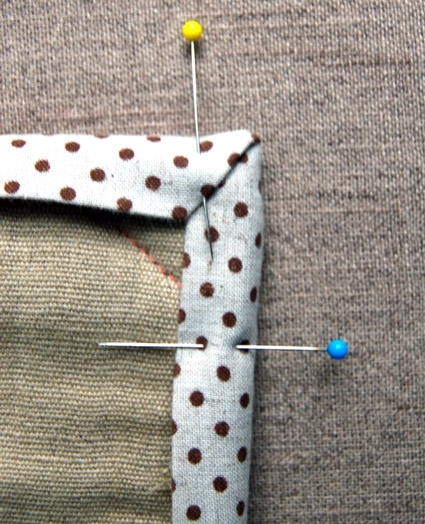 Repeat the steps above for sewing the binding until you come back to the beginning. 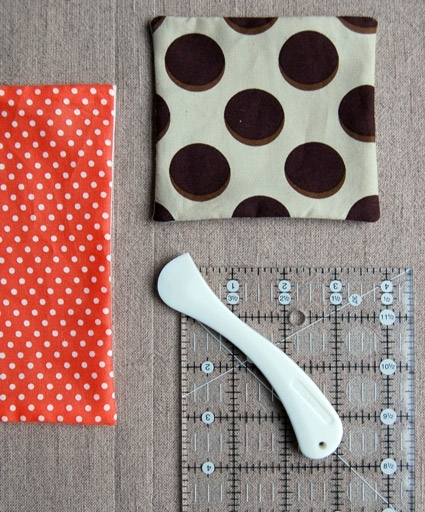 Stop sewing about 10-inches from where you started. 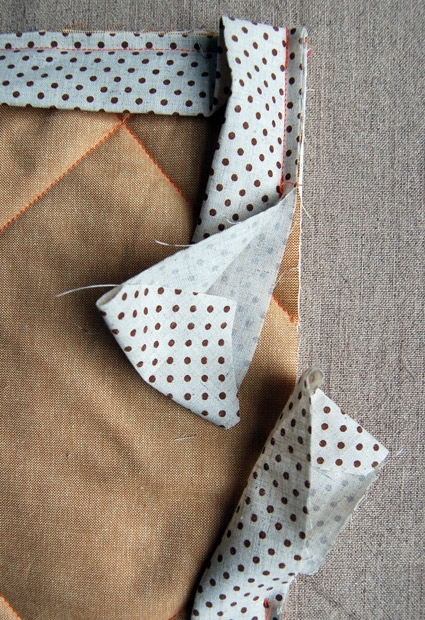 Trim ends diagonally (with the short side of the diagonal at the raw edge of the binding) as pictured above. 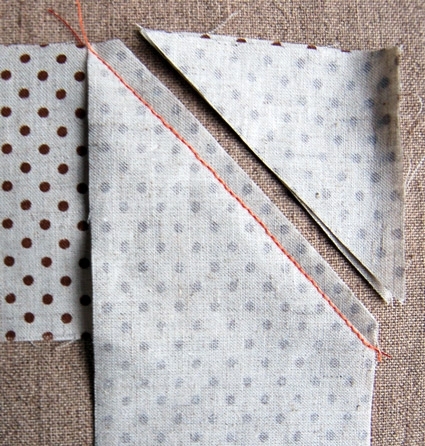 Be sure to leave enough fabric so that the ends can be folded back and still overlap as pictured below. Fold the ends of each side wrong sides together as pictured above. Place one strip inside the other and align all four raw edges. Pin into place. 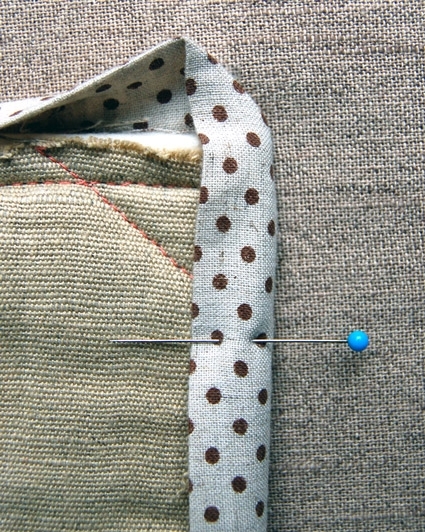 Sew remaining seam with a 1/4-inch seam allowance, backstitching at the beginning and ending of the seam. You’ll finish your binding by folding it to the other side of the project and hand-stitching it into place (follow the directions for the blind-stitch above). Use the seam line on the back as your stitching guide. 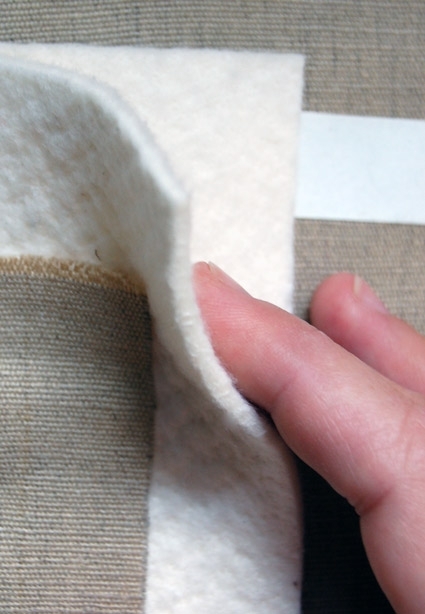 You will want to stitch just outside the seam line so that your binding covers the seam line as you go. When you come to the corners fold one side around the corner as pictured above. Finger press the diagonal fold at the top of the binding to create a nice corner. Fold the top of the binding around the corner as pictured above. 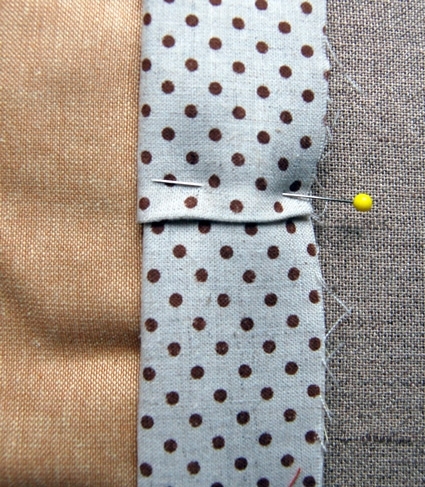 When you stitch the corner, just take an extra stitch in the backing fabric to secure both layers of the binding. Even though hand-stitching your binding seems like it might take forever, it happens to be one our favorite part! Its a great opportunity to sit back and enjoy the beautiful work you’ve done. 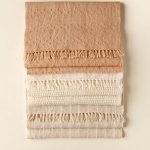 If you’d like to make a set of fringed napkins to go with your runner please visit Molly’s Fringed Thanksgiving Napkin Project Journal. –Happy Turkey Day!! Lovely as always and very inspiring. 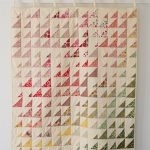 Thanks — and you ncluded a great tutorial on quilting, to boot! Fantastic instructions — I think I just learned about fourteen things reading through them — thank you. What a fantastic totorial. We don’t celebrate Thanksgiving here, but we DO celebrate Christmas. 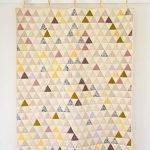 I think I see a table runner in my future! Golly gee willakers! I don’t know how to spell that, but my, how very thorough and helpful. 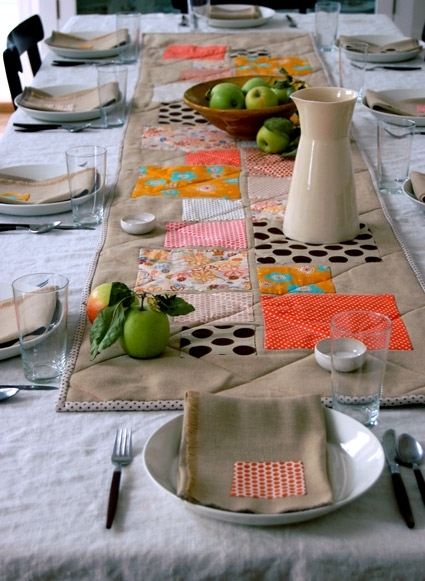 I tried to make a quilted place mat and it was only so-so. With these instructions I am sure to succeed next time! Thanks. This is such a superb project! I’m thinking of making one set as a Christmas present. But I’m a bit of a beginner with machine quilting… Would you be nice enough to tell me what stitch length you recommend for the quilting part? Thank you. that runner is gorgeous, and your instruction, as always, are great. but I have a question…if one were to use exactly the same fabrics etc that you did, assuming you had all the tools already, how much would this cost to make? 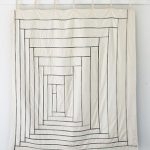 I love this site – thank you so much for posting such beautiful projects with such detailed, easy to follow directions! The runner is gorgeous!!! thanks for this.. cant wait to do this later at home.thumbs up for this! i am so looking forward to creating this project. An added bonus: the first time I’ve seen a tutorial on a blind stitch that makes sense to me. thank you for the generosity with which you share, and happy new year! That's so nice. It would love great on my table! 😀 I wish we were having guests this year, but I'll make one anyway. Thanks for the idea! I love all your patterns! I am making this for our Xmas table this year and I am really excited about it…I have an unrelated question…where did you find your beautiful wood handle flatware? I have been searching hi and low for silverware like that to no avail! Thanks for being awesome. Thank you so much for this pattern. I undertook this as a complete novice and learned so much. Your instructions are great and I love how adaptable the pattern is. I have used my new skills to make two more runners, quilted place mats and napkins – they are getting more finished looking each time! What a great site – really impressed with the quality of your patterns, projects and instructions. Thank you so very much for sharing what you do! This is a perfect tutorial and fairly easy project. I am saving this for later. It would make a great gift for any occasion.